Plans continued this week for the rebuilding of the jogging trail and playground next to Highlands Elementary School. Goose Creek school trustees voted at their meeting Monday night to accept a donation from the Highlands Rotary Club of $24,000 for the reconstruction of the walking/jogging paved path. The land is owned by the school district, and at one time had been discussed as a site for a new community library, but Precinct 2 has indicated they do not have money for this project in the forseeable future. The new paved jogging path will be made of asphalt, and be 8 foot wide and approximately 1/4 mile long, winding around the perimeter of the site. New playground equipment will be a future addition to the site, according to Rotary President Denise Smith. The jogging trail donation has been made by the Rotary Club in the name of one of its major benefactors, Mark Mulloy. 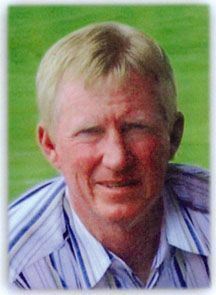 Before his untimely death in June 2009 he was CEO of Crosby State Bank, and before that owner/CEO of Highlands State Bank. Mulloy was a strong supporter of Rotary activities in Highlands and his home club of North Shore. Before his death he made a major contribution to the Highlands club, and they have sought to use it in a fitting way as a tribute to him, to his interest in the Highlands community, and for his work with youth. A plaque with his name and dedication will become a part of the park with the trail. The jogging trail will be used by students from Highlands Elementary, as well as the public when school is not in session. Teel Construction has been awarded the contract for building the track, and it is expected to be completed in May, before school ends. CROSBY  The Grand Lodge of Texas including many local Masons from Sampson Lodge #231 placed a cornerstone at Crosby Elementary School with the pupils in attendance. The solemn ceremony dating back some 300 years with connections to the stone masons of the middle ages was attended by the majority of the Crosby ISD school board, including Mason Gerald Blankenship who reminded those present of the history of the building dating back to 1982. Blankenship also introduced the Masons including the Worshipful Master, the man in the impressive Chain of Office Brian Duncan. Michael Joseph, former Superintendent of Crosby ISD schools also attended, founding the school was his idea according to Superintendent Keith Moore. 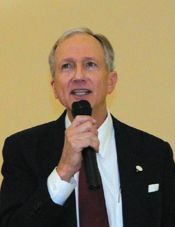 Moore introduced the field of speakers and honored guests, including David Park, Project Manager. Id like to formally express my gratitude to the Masons. We are all busy, have busy schedules but this is an important piece for us to formalize the renovation project. I thank you guys for taking your time out to do this. Although we are setting a cornerstone, I think we are teaching our students a lesson about civic duty. said Moore. Mr. Duncan explained the formative necessity of Masonic knowledge to building structures. He also described the details of the ceremonies and traditions to the audience. HIGHLANDS County Attorney Vince Ryan paid a visit to the Highlands-Lynchburg Chamber at their luncheon last Thursday. 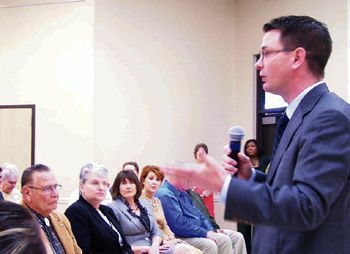 He reminded the large audience at the Community Center that he was running for re-election, in the primary and the November election, and then delivered a talk about county services that his office offers. Due to budget restrictions, he has had to cut back his staff from 225 when he took office, to 175 employees now. About half of these are attorneys, he said. Because the workload has not diminished, he has had to find efficiencies for his office, including more computerization of records, and the use of private attorneys on contract for some cases. He is also studying the possibility of his office collecting back taxes, which would save the county the 20% they now pay to an outside collection firm. His office is charged with advising county employees on the limits of government, in Texas and Harris County. Harris County is only one of four counties in the state with both a District Attorney and a County Attorney, due to its size. Cases he is currently working on include the MERS suit, which charges banks with illegally processing mortgages without filing them with the county. This keeps the county from collecting millions in filing fees. Another ongoing case is the Toxic Waste site in the San Jacinto River. Working with the EPA, his office is attempting to have all toxic materials permanently removed from the river at the expense of the two companies that originally dumped them there. They are also investigating a second dump site discovered south of I-10. 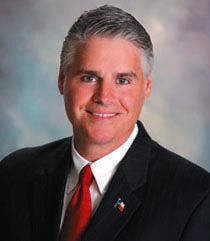 AUSTIN: District 127 Representative Dan Huberty is appointed to the Joint Interim Committee to Study the Public School Finance System. committee was created through Senate Bill 1, 1st Called Session, 82nd Legislature. The future of Texas is being forged in our classrooms every day, said Lt. Governor Dewhurst.That is why the Texas Legislature remains dedicated to continuing our investment in public education, directing more resources to the classroom and improving the quality of learning for every student in every school and every district across our state. Committee. Members include: Senators Bob Deuell (R-Greenville), Robert Duncan (RLubbock), Juan Chuy Hinojosa (D-McAllen), Jane Nelson (R-Flower Mound), Dan Patrick (RHouston), Kel Seliger (R-Amarillo), Carlos Uresti (D-San Antonio), Leticia Van de Putte (D-San Antonio), Royce West (D-Dallas) and Tommy Williams (R-The Woodlands). Rafael Anchia (D-Dallas), Rob Eissler (R-The Woodlands), Ryan Guillen (D-Rio Grande City), Donna Howard (D-Austin), Dan Huberty (R-Houston), Susan King (R-Abilene), Todd Smith (REuless), Vicki Truitt (R-Keller) and Mike Villarreal (D-San Antonio). BARRETT STATION A dedicated young man decided four years ago, that he could make a difference in the lives of the youth and families in this community. Thinking that an organization that would focus the help of many volunteers was the right vehicle, he formed the East Harris County Empowerment Council, and proceeded to undertake a number of worthwhile community service projects. 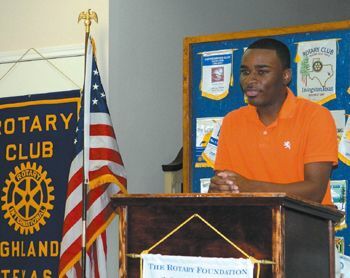 Trey Narcisse spoke recently at the Highlands Rotary clubs luncheon meeting, about his vision for this work. He said that after seeing a good friend of his killed in 2008, he looked for a better direction for his own life. He studied many paths, including the tenets of Paul Harris, founder of the Rotary Clubs. Narcisses goal is to help people live better, with the help of volunteers and collaboration with those who can assist. With a board of directors from Crosby, Barrett, and Sheldon, and funding from individuals, businesses, and corporations, he has proceeded to accomplish a number of community service projects. These include holiday toy drives, Thanksgiving dinners for families, Back-to-School drives and health fairs, Meet the Candidate Night, Business Mixers, a Community Picnic for Veterans, Seniors, and Families, a Run to Remember on 9/11, a $4000 grant for a 2012 MLK Day of Service Project, and much more in the last 4 years. More than just accomplish service projects, Narcisse wants to build future leaders in the community and develop collaborations with other organizations. He expects that from his work, others will join to prepare youth and families with knowledge, skills and real-life experiences. He wants to build up the civic minded and skilled leadership in the community. Another goal is to increase the marketability of members of the community for jobs in the economy now and in the future. In 2010 Narcisse received the Crosby-Huffman Chamber of Commerce Presidents Award for his efforts. The Highlands community missed the Pilot Club Fair in February, which signalled a change in the clubs status, according to local sources. The local club will hold meetings through May, and then no more. Members of the club will either join clubs in adjoining communities, or not belong at all. 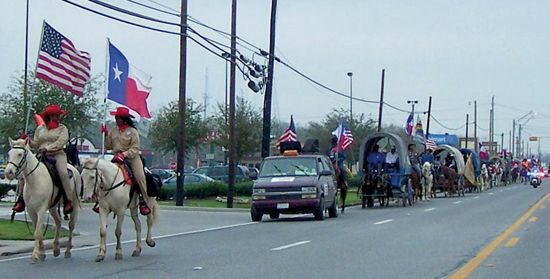 The Pilot Club of Highlands was chartered in April 1998, sponsored by the Pilot Club of Baytown, and had at its inception over 60 members. However, membership has dropped greatly, with only about a dozen current members, not enough to sustain the club and carry on with their community projects. The first president of the club was Laura Estes, with Janetta Walker as President Elect. In 2004 the club received the Community Builder Award from Sampson Lodge, for their community projects. These included a long list of achievements, such as landscaping at four corners, the park on railroad land in the center of town, historical signage at the Lynchburg Ferry landing, a welcome sign on Main Street, scholarships, Community Clean-up Day, collecting teddy bears for the sheriffs office, support for Relay for Life, welcome bags for new teachers, parties and visits to seniors with emphasis on brain-related injuries, flags and decorations on Veterans holidays, and participation in Christmas ceremonies at the park and lighting ceremonies at the Ferry landing. The largest and most important project was the Community Fair at the Elementary School, which they sponsored for 13 years. The current president of the club is Susan Precht. The club has met once a month on Monday evenings, at the Highlands Community Center. The demise of the club is reminiscent of many other clubs that have thrived and then withered away in Highlands over the last few decades. These include the Jaycees, the Art Guild, and many more. Pilot Club members interviewed by the Star-Courier indicated that one of the problems with sustaining the membership is that younger people seemed to have busy lives with other interests, and not enough time for a community service club. HIGHLANDS  A womans body found in the San Jacinto River early last Saturday has tested to be that of a Beaumont woman last seen on Feb. 27. A fisherman near Monmouth Road under Interstate 10s bridge called authorities concerning having spotted a body in the river mud at about 7:40 in the morning on March 3. 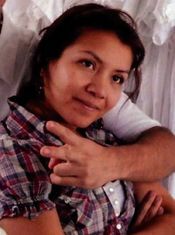 Reina Cornejo-Triqueros, 37, was last seen on Feb. 27 when at about 8:00 a.m. she left home to go to work at Willy Burger in Beaumont. At about 9:00 a.m. she telephoned her supervisor from a Sour Lake pay-phone to say she was running late. Harris County Sheriffs Deputies arrived at the river at about 8:00 a.m. March 3 and saw that the remains were shrouded in a shirt like the one described that Triqueros was wearing the last time she was seen by her family. Acting on a tip, Jefferson County Sheriffs Office Investigators discovered her partially burned truck under U.S 59 at Hamblin Rd. in Kingwood two days before the body was found. There was physical evidence within the truck that indicated there had been a violent struggle inside. A warrant has been issued for Jesus Roman-Castrejon, 52, of Conroe. Montgomery County Detectives allege that Reina was seen in Castrejons neighborhood days before the truck was found and that office sought the warrant. Some members of Reinas family had stated that Castrejon had befriended Reina when they worked together in Houston. He wanted the friendship to be more but was rebuffed by Reina. Jefferson County Sheriffs Investigators had called Castrejon when she went missing but were told he had not seen her. The Texas Rangers, the Drug Enforcement Agency Air Wing, Houston Police Marine Division and the U.S. Marshals office have now joined the search for Castrejon. Authorities say the undocumented fugitive has probably fled back to Mexico but another source says he has gone to California in cooperation with a gang in that state. Crimestoppers is offering $1000 for information leading to an arrest of Castrejon, call 713-222-tips. Your information remains anonymous. Reina Cornejo-Triqueros had lived in this country for 12 years with 3 sisters and was mother to a six year old. Her body has been released to her family. 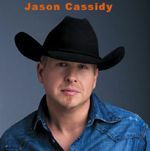 CROSBY  The Crosby Fair & Rodeo Spring Dance will be held on March 24 and Jason Cassidy will be the feature act. Deep, rich, baritone Jason Cassidy author of My Redemption on A-Blake Records in Deer Park, will render his own style of Neo-traditional Country Music for the pre-rodeo fund-raiser and dance that each year raises money to fund the Livestock Auction that proceeds the Crosby Fair & Rodeo. Tickets are now available for $15 per person by calling the rodeo office (281) 328-2113 or go by Crosby ACE Hardware, FM 2100 at Wahl St. The dance lasts from 9:00 p.m. until 1:00 a.m.
Cassidy is now #6 on the Texas Music Scene with his hit single Honky Tonk Heaven a tribute to the Red Dirt Texas Country Scene. A devotee of George Strait, Cassidy is dedicated to the retelling of true life experiences with an emphasis on heart and faith. He uses King George as a guide. Cassidy, a Montgomery County native, played his first gigs in the local honky tonks and the hard life left him with a busted marriage and two kids and now A devotee of George Strait, Cassidy is dedicated to the retelling of true life experiences with an emphasis on heart and faith. He uses King George as a guide. Cassidy, a Montgomery County native, played his first gigs in the local honky tonks and the hard life left him with a busted marriage and two kids and now he is a regular church attendee, married to the love of his life Brandi and a classic car re-builder. He comes to the stage without the gimmicks or flash but a deep set of convictions and a deeper voice. He plays alongside Scott Johnson on fiddle and Harmony vox. Big John Towslee plays lead guitar. Dan Lindsey plays bass and Spencer Booth plays drums. CROSBY  Precinct 2 Commissioner Jack Morman was received with a packed house at the Crosby Community Center on Wednesday morning, Feb. 22 and he was there to listen. If there is anything to take from this meeting it is that we are working for a smooth transition, we are going to work our tails off to see that that happens. said Mormon of taking over from Jack Cagle after Harris County Precincts changed with redistricting and now most of East Harris County including Crosby and Huffman are part of Precinct 2. He introduced Precinct 3 Constable Ken Jones to speak briefly and Jones pointed out that he has been working with the commissioner on issues that effect the public in local neighborhoods. Jones pointed to the initiative shown by the commissioners four visits to his office and the high quality of people he has brought to work for him. The first problem brought to the commissioners attention was for permanent voting locations for neighborhoods. That may be a matter of redistricting of the School Boards but Morman answered clearly, To be perfectly honest right now with redistricting up in the air, we dont know what the State process is going to be, said Mormon. A new initiative called Better Streets 2 Neighborhoods was announced as an outreach to solve road problems that came up following the drought and then increased downpour as well as the on-going struggle against increasing populations and ever decaying roads. We are going into neighborhoods finding roads that need work and they may not even be county roads and we are redoing the roads, said Mormon.